When you think of Avengers: Infinity War and its years of lead-up, you probably think about climactic, superpowered battles more than you do a clever villain eluding hapless heroes. But Infinity War directors Joe and Anthony Russo revealed in an interview with CNET that the long-awaited team-up film will actually have a very heist-like vibe; just substitute Thanos in as the cat burglar and Iron Man as Inspector Clouseau. 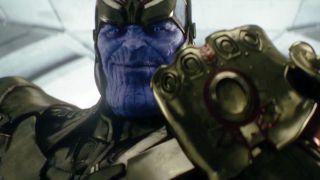 "With Infinity War, the biggest new element to the movie is Thanos and the fact that he's entering the storytelling in a very bold, strong way, to the degree that he's almost one of the leads," Anthony Russo explained. "We've shaped an interesting narrative around him that in some ways leans heavily on a heist film in the fact that he's going after the infinity stones in a much bolder, successful way than he has in the past. "The entire movie has that energy of the bad guy being one step ahead of the heroes. We looked at a lot of movies that had that heist-style energy to them, [and] that brought some inspiration." It's very much an ensemble piece, too, and a big part of the fun will come from seeing how all of these characters interact - whether it's their first meeting or a long-awaited reunion. Not to mention spending some screen time with ones we haven't met yet, or haven't had the chance to really get familiar with. "There's going to be a lot of unexpected characters," Joe Russo teased. "There are more surprises packed into this film than any of the others. Part of that is character interactions, new interesting characters, characters that have made small appearances that are really getting fleshed out in this film. A lot of people enjoy the experience, so I don't want to give anything away, but certainly you can expect lots of surprises." Part of the reason Marvel movies still feel fresh after almost a decade of films is that they're all different genres. And it looks like Infinity War might even give the familiar cast a shake-up, if its sequel really does begin with a funeral.